Hi everyone! Welcome back to The Knowledge Pool! This week I’m bringing you a new deck I’ve recently added to my arsenal, and one that I’ve been super excited about lately. When I first saw Ghalta, Primal Hunger I was underwhelmed. Shocking, right? Wizards presents us a massive green legend, and I’m not excited? The truth is, the cards that tend to get my Timmy senses tingling aren’t just big, they also do something big. I typically prefer commanders that enable overwhelming interactions, as opposed to those that simply run over the opposition. By extension, I’ve never been a fan of “Voltron” decks in commander, primarily because I find the heavy investment into a single creature to be too much of a liability to be consistently reliable. My first impression of Ghalta was that she would enable a Voltron-style shell because of her massive body and natural trampling evasion. However, my mind was changed by an episode of The Commander’s Brew featuring Ghalta. For those of you unfamiliar with the Commander’s Brew, they’re a podcast that focuses on building budget Commander decks. While I don’t typically build my decks with the same harsh conditions they do, I love to listen to their show because the monetary boundaries require Sean and Andy to think outside the box, and really focus on themes and mechanics. Often, the Commander’s Brew will present a creative interpretation of a particular deck, and hearing them describe fringe cards forces me to consider possibilities for a commander that I otherwise may overlook. This was the case with Ghalta. The Commander’s Brew helped me to see beyond my impression of Ghalta as a Voltron commander, and recognize the potential she possesses as the main beater in a “stompy” style deck. If you end up liking the direction I take with Ghalta, I strongly suggest you check out the Commander’s Brew episode to get their take on the deck. Let’s explore the concept of a stompy Ghalta deck a little bit more. If you’ve read any of my articles, or if you’ve been playing Commander for any length of time, you’re likely aware of just how good green is at generating a board presence. Green is blessed with cheap, high-power creatures and the means to cast them quickly (ramp). Both of these qualities synergize with Ghalta and her natural cost reduction. In most games, we can consider Ghalta to be one of our “early-game” threats, which is not something that can be said about most other 12/12s! If we design our deck around playing the biggest and most efficient creatures possible, we can expect to be reliably putting tremendous early pressure on our opponents. However, perhaps the most powerful aspect of Ghalta’s cost-reduction ability is that it effectively nullifies commander tax. 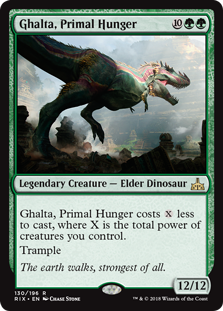 Ghalta will be a must-kill threat for most of our opponents, and for most commanders, we would be forced to build in extra protection to ensure her survival (hence my frustration with Voltron-style decks). As long as our board survives, Ghalta’s cost will usually be hovering around 2-4 mana. Even if our board doesn’t survive, casting any other large creature will suddenly make Ghalta’s return a near inevitability. This is what makes Ghalta a scary commander. It isn’t the fact that she’s going to run you over, it’s the fact that we can play out our gameplan of casting big green creatures, and she will always follow close behind to act as the spearhead of our army. Friends in my playgroup have described me as “the greenest player they know”. Despite this title, and despite my long tenure in the Commander format, I’d never built a mono green deck. Admittedly, I love building 2-3 color decks because of the additional card choices they offer, resulting in fewer weaknesses overall. Of all the colors, however, green is perhaps the most well-equipped when it comes to Commander (at least from a non-competitive standpoint). Green can remove any noncreature permanent, ramp, draw cards, and present substantial win conditions. Removing creatures doesn’t tend to be our biggest concern, given that we usually have the biggest creatures at the table. In an aggressive shell like this one, our primary concerns are token armies that can go wider than our army and Wraths that threaten to undo all of our work. Certain combos can also be an issue for us, but many of Commander’s common combos can be solved by a Krosan Grip. In exchange for these weaknesses, focusing on a singular color offers us some benefit. 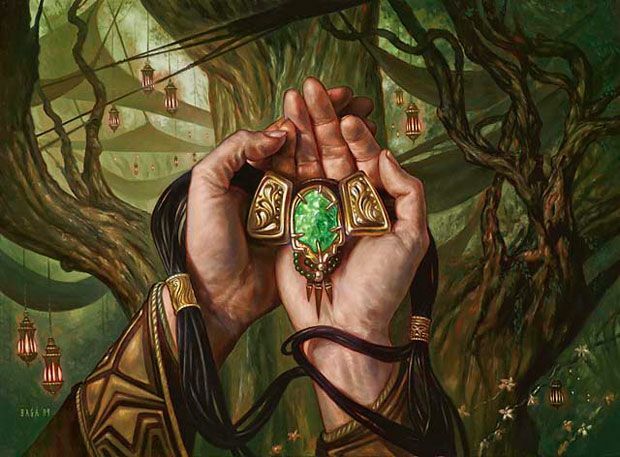 There are a variety of cards that specifically reward us for our devotion to green, and we will make the best of them. Deck Goals: Use green’s natural ramping and creature strengths to put pressure on opponents early. As we build a board, use Ghalta’s massive size to push damage through while maintaining pressure through all stages of the game. Check out how I categorize the cards in this deck and the curve-breakdown on TappedOut: Ghalta, Primal Hunger. Given the goals of our deck, it shouldn’t come as a surprise that our list is very creature-heavy. We have 38 creatures, 10 of which are specifically included for their ramping capability. Our curve sits right around 4 CMC, so having plenty of ramp is a necessity. We also have a heavy focus on the 3-drop spot in our deck with 16 total 3-cost spells, so the ability to play a mana dork on turn one is valuable for reliably casting our spells on turn two. The remaining 28 creatures are included for their size and utility, and we will go into more detail on these shortly. Our noncreature spells are mainly intended to remedy the weaknesses of our creature-centric build. More specifically, these spells are included to protect our creatures, draw us cards, and remove problem permanents. It’s also worth noting that we have four Planeswalkers in this deck, which also fall into utility roles. 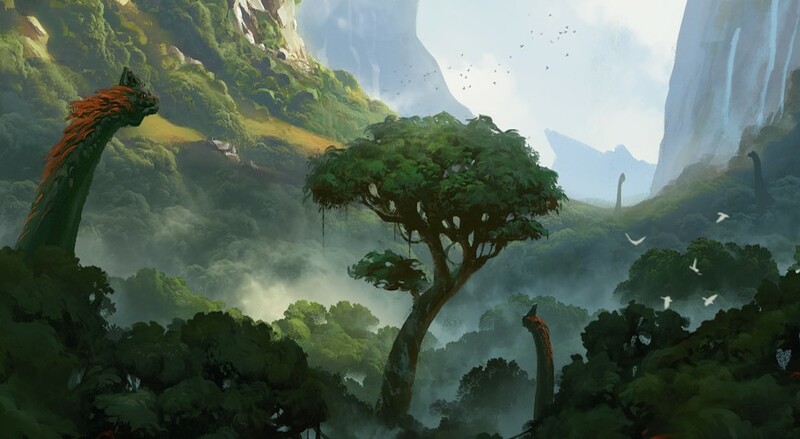 Walkers are one area where we’re rewarded for playing mono-green by synergizing with our creatures, making use of our forests, and helping to reduce Ghalta’s cost. With these numbers in mind, let’s take a look at some of our card selections in detail to get a feel for how this deck intends to play-out. With Ghalta in mind, I tried to choose big creatures that also offered abilities that would help us to stabilize in a multiplayer game. Luckily, Wizards has moved towards powerful creatures in the modern age of Magic, and so we have a wealth of potential options with a mix of size and ability. In some cases, a creature’s potential size-to-cost ratio was too impactful for me to ignore, even if it lacked a relevant ability. This was also true in a few instances where a creature’s ability was too unique to ignore despite its smaller size. I made exceptions to accommodate such cards. If we attempt to categorize the 28 non-ramping creatures in the deck, we end up with five clear distinctions: Removal, Card Advantage, Combat Effects, Roleplayers, and Huge Creatures. Each of these categories presents a necessary element of achieving our deck goals, giving us answers for most situations. Let’s start with the “Huge Creatures”, seeing as they will likely be offering the biggest discount to our commander. The “Huge Creatures” are the most straightforward inclusions in the deck. These five were selected because they are big, or else have the potential to grow big quickly, and therefore represent a significant reduction in cost for Ghalta if we can keep them on board. I also particularly like these creatures because they represent a real clock on our opponents, and thus represent significant pressure on their own. 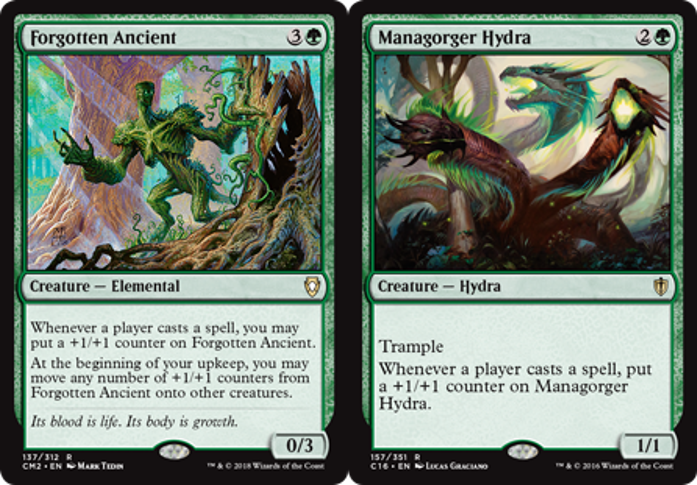 Managorger Hydra and Forgotten Ancient function similarly, taking advantage of the multiplayer nature of Commander. Given our heavy slant towards ramp, we will have the ability to cast these early, which will start them growing out of control before our opponents can deal with them efficiently. For this reason, these two represent two of our best options for powering out an early Ghalta. For me, Ancient is particularly exciting in this deck. I love that it can pass around its counters to our other creatures to limit our vulnerability to spot removal. Being able to move counters around in this way also means we can turn some of our dorks or lower-power utility creatures into real threat if our opponents can’t find an answer. Hydra Broodmaster has become a staple in my decks lately, and here it’s effective for multiple reasons. Its base 7/7 body already makes Ghalta a significantly easier cast, and the following turn we should have enough mana to activate Broodmother’s Monstrous ability, creating three 3/3 bodies. With the additional tokens and counters, we should be able to cast Ghalta for GG in almost every circumstance. The beauty of Broodmaster is that with extra ramp or one of our mana doublers, she has the potential to take over the game on her own. Kalonian Twingrove makes use of the fact that we are running 31 Forests. If we cast Twingrove on turn 6, it will usually represent 12 power for our board, and each additional forest we play will make casting Ghalta easier and easier. Rampaging Baloths also makes use of the lands we play, generating 4/4 tokens with each Landfall trigger. This means that after a single land drop Ghalta’s cost will be reduced by 10. Honorary Huge Creature: Sandwurm Convergence. Technically Convergence is not a creature, but it’s included in this deck because it makes creatures. Lots of creatures. The fact that it forces our opponents to deal with us on the ground is the reason this card made the cut, as it makes us a very difficult target to kill through combat. Of all of our Huge Creatures, there’s only one problem: evasion. Hydra and Baloths have trample, but Broodmother, Ancient, Twingrove, and all of our tokens will have trouble making contact through a gummed-up board. This isn’t the end of the world, because Ghalta has natural trample and represents a lot of damage on her own, but we want to make sure we have a backup plan in case we can’t keep Ghalta on board. Don’t worry though, we’ve ways to give our Huge Creatures trample, and we’re going to explore those options now as we look at our “Combat Effects”. This is the first section where we really get to observe the convergence of utility and size. I’ve selected these creatures for their ability to make our combat step most profitable, while also making Ghalta readily available. I spoke about Rhonas the Indomitable in detail in my Mayael article, and it’s equally as effective here, if not more so. This deck is perfectly suited to make use of Rhonas, and he will almost always be available to attack or block. The fact that he’s indestructible with a 5/5 body makes him an incredible asset for Ghalta, representing a perpetual cost reduction, and the fact that he has an activated ability is just a bonus. Luckily for us, his activated ability is a pretty significant bonus, allowing us to grant a small buff and trample to another creature. This buff will serve to reduce Ghalta’s cost, but we’re more concerned about being able to give one of our other fatties trample. Nylea, God of the Hunt is the other God in this deck, and fills a similar role as Rhonas. While Nylea isn’t natively a creature, she does offer our whole team trample regardless of our Devotion. And let’s be honest, in a mono-green deck focused on creatures, accruing Devotion will be easy. In most cases, Nylea is another indestructible fatty. Goreclaw, Terror of Qal Sisma is an incredible new addition to this deck, with abilities that perfectly synergize with everything we’re already doing. Goreclaw’s body and ability represent a combined cost reduction of 6 for Ghalta, and the fact that it reduces the cost of our other big creatures by 2 will make assembling a monster board very easy. However, this section is about combat effects, and Goreclaw has an awesome one. When we attack, all of our 4-power creatures will get a small buff and trample. The additional +1/+1 to each creature gives an additional cost reduction to Ghalta, while the trample is the perfect evasion for our big dudes. We have two remaining trample enablers: Pathbreaker Ibex and Stonehoof Chieftain. While Ibex doesn’t offer much in the way of cost reduction, it’s potentially our deadliest threat with Ghalta on board, granting a +12/+12 buff and trample to our entire team. Chieftain will be difficult to remove, and will make sure we never lose in combat. Our last two Combat Effects are unrelated to trampling. 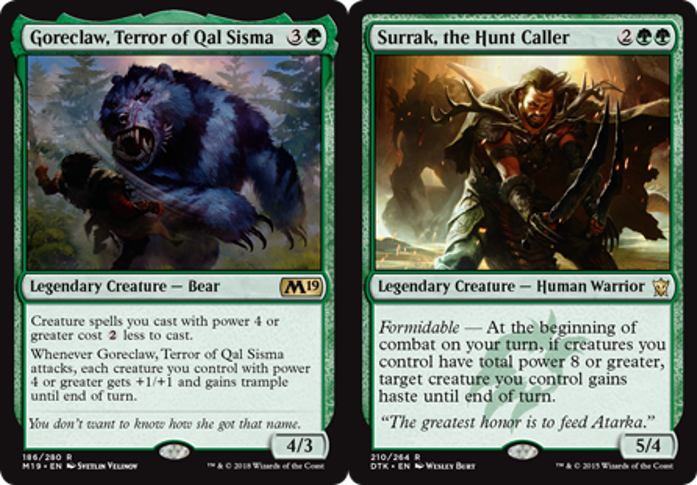 Surrak, the Hunt Caller is one of the few ways that green has access to haste, and we will rarely have trouble achieving the Formidable cost even without Ghalta. Surrak’s haste will help us ensure that our biggest dudes are able to attack with as small a window as possible for our opponents to answer them. Verdurous Gearhulk will arrive and buff our team. The 8 additional power to the board will likely be the final push we need to cast Ghalta, and the fact that we can spread 4 of it around is insurance against spot removal. Now that we’ve talked about our biggest dudes, and the ways we’ll be ensuring that they do damage, it’s time to talk about some ways to find our threats with our “Card Advantage” section. Let’s start with Card Draw. Lifecrafter’s Bestiary, Selvala, Heart of the Wilds, and Tireless Tracker are each ways slowly and reliably draw cards just by following our game plan. Bestiary is a perfect fit for a deck with 38 creatures, and the scry each turn is a welcome side effect. 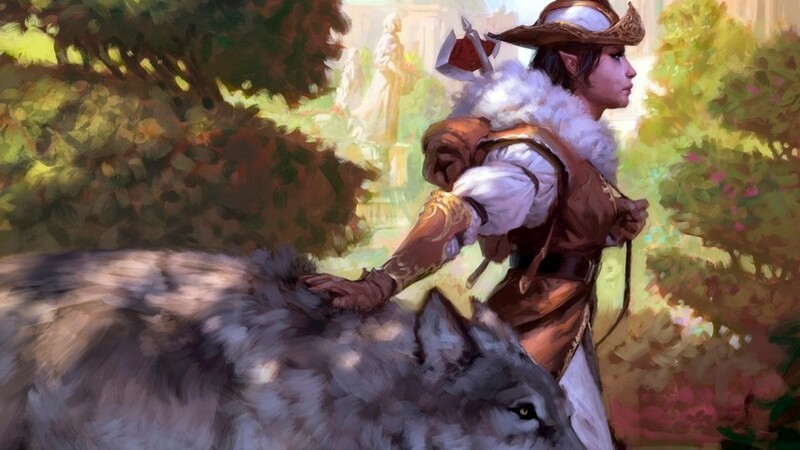 Selvala is primarily in this deck for the obscene amounts of mana she makes in concert with our fatties, but the fact that she can draw a few additional cards whenever we play a fatty or Ghalta shouldn’t be overlooked. Finally, Tracker lets us accumulate cards as we play our lands, and each Clue we pop has the added bonus of buffing Tracker and reducing Ghalta’s cost. Garruk, Primal Hunter and Rishkar’s Expertise will let us draw a ridiculous number of cards, especially with Ghalta on board. Garruk is primarily included for his card drawing ability, although his ability to make 3/3 tokens is nothing to scoff. Expertise is card draw stapled to the ability to play spells for free, often providing us with another large creature to help advance our board state. Greater Good also performs similarly to Garruk and Expertise, and even though Recursion is a weak point for this deck, sacrificing a creature in response to an opponent trying to kill or steal one of our dudes will put us far ahead. It’s also worth noting just how good Greater Good is with Ghalta. We’re already designed to reduce Ghalta’s cost as much as possible, and drawing 12 additional cards should ensure that we have more ways to make up for the added commander cost(s). 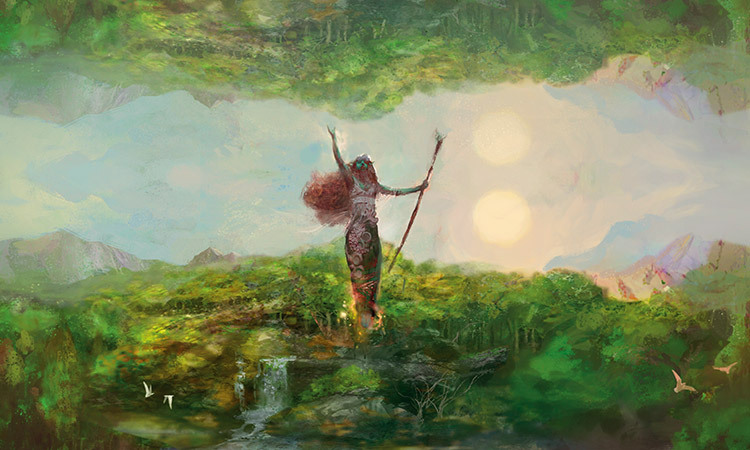 Zendikar Resurgent and Soul of the Harvest reward us for our high creature count. Resurgent’s mana doubling should put us far ahead on board, and its draw trigger could allow us to cast multiple spells per turn. Soul offers the same effect, along with a big body to put Ghalta in reach. This is the perfect deck for Garruk, Caller of Beasts. His plus ability should net us multiple cards almost every activation, while his minus is good-old-fashioned cheating of mana costs. In a deck like this, both of these abilities should prove useful most of the time. Moving on to Recursion, we have two options: Eternal Witness and Nissa, Vital Force. Witness shouldn’t be a shock to anyone (it’s one of the most-played cards in Commander), and here it will get us back whatever we need. Nissa operates similarly to Garruk, Primal Hunter, as we’re mostly concerned about the minus ability (returning permanents from our grave to our hand). Normally, Nissa’s land animation is a rather boring ability to me, but in this deck we can animate a land as a means of “ramping” towards Ghalta. A special note about Nissa is that her ultimate is really easy to activate. I don’t typically talk about Planeswalker ultimates because they don’t tend to happen unless you’re playing with Doubling Season, but after a single plus activation, Nissa is within range to ultimate. Nissa’s ultimate is really good, drawing us cards for every land drop. Our last three cards aren’t so cleanly sub-categorized. Genesis Hydra makes use of all of our ramping to create one big monster that usually brings another big body with it. 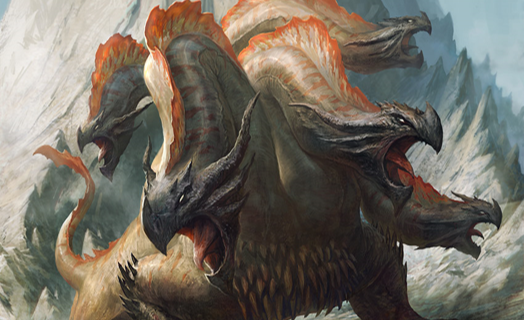 In some ways, Hydra is an honorary Huge Creature, representing the potential to put us in Ghalta range immediately. 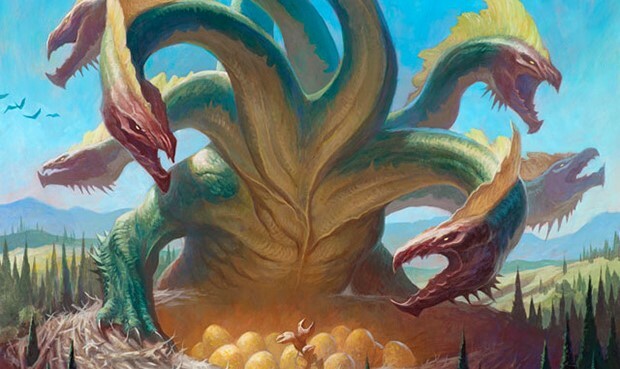 In my experience, Ulvenwald Hydra is always huge, but more importantly, we have several lands in this deck that we’ll want to tutor for, depending on the situation. Finding cards like Homeward Path or Rogue’s Passage could easily make the difference between winning and losing a game. Finally, Woodland Bellower is another form of tutoring, and given the diversity of abilities attached to our creatures, we will always be able to find something valuable, whether it’s Eternal Witness for recovering our spells, Thrashing Brontodon for killing that pesky Mind’s Dilation, or Wayward Swordtooth so we can cast Ghalta and empty the lands from our hand. Let me preface this section by acknowledging that we’re lacking the amount of removal I normally consider acceptable. However, given our aggressive focus, I’m willing to trade some amount of removal to make our gameplan as effective as possible. I mentioned previously that green tends to be deficient in their ability to kill creatures. I also mentioned that in a deck like this we don’t tend to care, given that our dudes will usually be the biggest at the table. This being said, it’s still useful to have some options for dealing with problem creatures, especially when they’re threatening a lethal strike, or else in the way of our own. 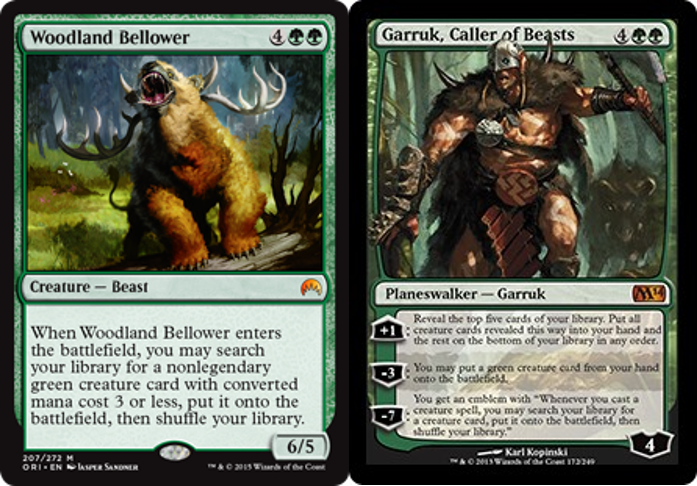 Ulvenwald Tracker is an ideal option for this deck, using our big dudes to pick off things in our way. The fact that Tracker is so cheap and its ability is reusable will often force our opponents to need to deal with it. Polukranos, World Eater is big, and when we activate its Monstrous ability it will become huge. With our focus on ramp, it’s not outside the realm of possibility that Polukranos could eat several creatures, or else wipe out a bunch of tokens trying to keep us out of the red zone. Arbor Colossus is a more specialized answer, but oftentimes killing a big flying creature will be critical. 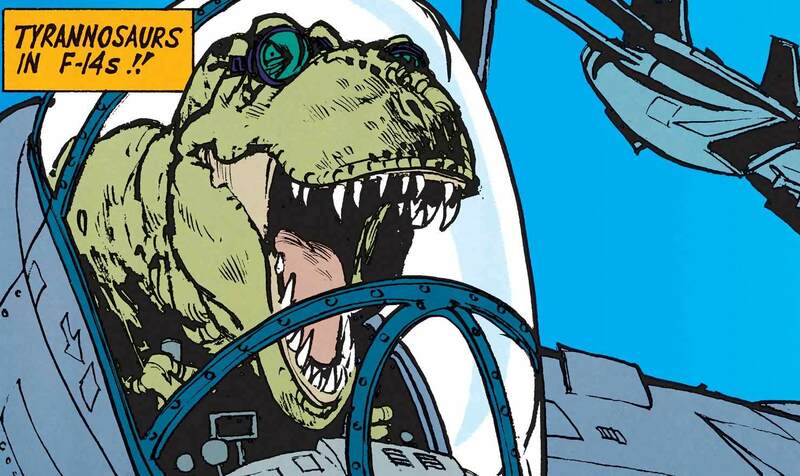 For artifacts and enchantments, Thrashing Brontodon, Terastodon, and Bane of Progress are three of our best options. We’re also packing Krosan Grip as an instant-speed combo breaker. Beast Within is this deck’s catch-all for any permanent that causes problems. It’s also worth noting that Berserk can function as creature removal in a pinch, while also allowing Ghalta to punch through with lethal commander damage out of nowhere. Our last four creatures are more specialized, and don’t clearly fit in any of the other categories. Scavenging Ooze is our best option for dealing with graveyard-focused decks. Each creature Ooze eats also puts us one step closer to getting Ghalta into play. While counterspells aren’t a huge concern for us, Prowling Serpopard is a perfect answer to them, and its 4 power for 3 mana makes it a worthy inclusion. Wayward Swordtooth is functionally similar to Rhonas, offering us a cost reduction to Ghalta and a static ability. We shouldn’t have much trouble Ascending, and then Swordtooth can help us apply pressure. Finally, Yeva, Nature’s Herald is a pet card of mine, and this is the perfect deck for her. She’ll let us pump out any of our big creatures during the end step so we can alpha strike next turn. The potential to ambush our opponents is good enough, but she also contributes 4 power to our cause. Now that we’ve explored in detail the value our creatures bring to the table, it’s time to finally acknowledge the ramp package that will make this all a possibility. Our ramp package is 17 pieces, 10 of which are creatures. I tried to focus primarily on creature-based ramp so as to contribute a little extra towards casting Ghalta, but the 7 noncreature ramp spells are included because I felt they offered too much value to be ignored. I’m not going to go into too much detail here, primarily because most of the ramp in this deck is fairly standard. I would like to acknowledge Vernal Bloom as an option suggested by The Commander’s Brew. Unless there’s another mono-green deck at the table, Bloom should primarily benefit us, allowing us to break any symmetrical effects it offers. Alongside Bloom, Boundless Realms and Zendikar Resurgent are our mana doublers. This deck will always have many things it wants to be casting, and doublers will help ensure that we can. Traverse the Outlands is an honorary doubler for this deck, given that it can net us 12 lands when Ghalta is on board. There are two honorable mentions for the “Ramp” category. First is Green Sun’s Zenith. I mentioned previously that we want to always have a 1-drop ramp spell if possible. Counting Sol Ring and our mana dorks, we have five. With Dryad Arbor in our deck, Zenith is a sixth 1-drop ramp spell. The beauty of Zenith is that it scales, giving us an edge early game and finding us a surgical answer later on. The second honorable mention is Nissa, Worldwaker. Like Nissa, Vital Force, Worldwaker has the ability to animate a land for Ghalta, but she can also untap four forests, putting her at a better rate than equivalently-costed spells like Gilded Lotus. It’s possible that Nissa isn’t necessary here, but I feel that this deck won’t be upset to have the extra ramp or body. Scute Mob could fit well in a deck like this. Regardless of whether or not you play it early or late game, it feels like the kind of card that most opponents will ignore until it’s a big problem. The reason it didn’t make my cut is that it’s not good at applying pressure early on, and really doesn’t do much until the game has progressed a bit. I’m worried it’s too slow. Growing Rites of Itlimoc (by extension Gaea’s Cradle) is probably the first card that I want to reintroduce to this deck when I figure out which cards underperform. Especially since we have 38 creatures, it seems like we should always be successful in “drawing” a creature off the enchantment side. My primary concern is the consistency with which we’ll have 4 creatures on board. I foresee games where we’re riding 2-3 large creatures to victory, and if our dorks gets Wrathed, we’re not particularly well-prepared to rebuild a “wide” board. It might still be worth testing however. If you have extra Cradles lying around, congratulations, one of them should be in this deck. Rishkar, Peema Renegade brings 4 power to the board, and also creates two new mana dorks (resulting in the equivalent of 6 mana towards Ghalta). I love Rishkar, and he’s in many of my decks. However, given the glut of 3-drops we currently have, I opted to try Somberwald Sage instead, since it doesn’t require the same board presence. Vorinclex, Voice of Hunger is a perfect fit for this deck. It’s huge, it’s evasive, and it doubles mana. It also does a very good job of preventing our opponents from playing the game, and will likely make us the primary target at the table. The fact that Vorinclex is not included is a personal decision, and a result of playgroup I’m a part of. If your group is fine with these sorts of effects, I wouldn’t fault you for swapping him in over another fatty like Ulvenwald Hydra. 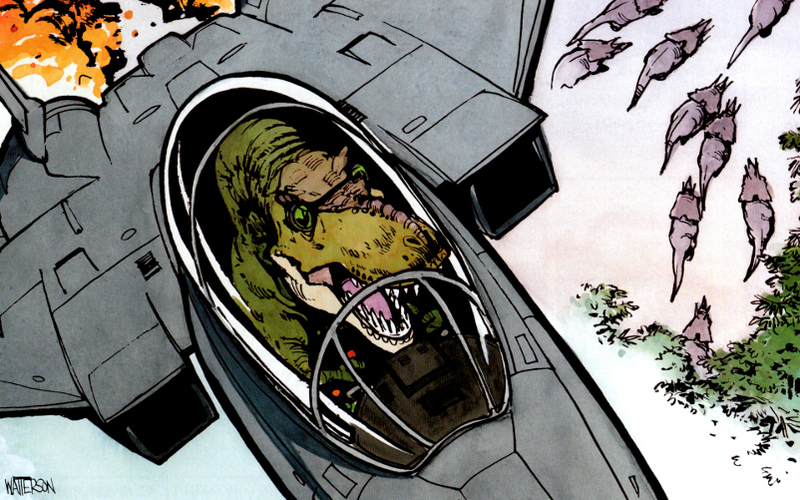 Gigantosaurus is big, and if you want more dinos, you should probably start here. Grothama, All-Devouring is hilarious, and I’m sure you could come up with some really neat ways to turn this guy in your favor. Frankly, it’s pretty easy, considering Grothama makes Ghalta cost 2, and then Ghalta can eat Grothama to draw 12. I personally think Grothama, is probably better at the helm of its own deck, so you can always make the most of its ability, but if you’re in the mood for a more politically-focused game, this is a great include. I hope you all enjoyed exploring Ghalta with me! This is one of the most unpopular commanders I’ve covered so far (only 89 decks on EDHREC! ), and I’m hoping that I’ve inspired you all to give her a shot.